The "new" parish of Torpoint, created from Antony in 1819, lies in the south-east corner of the older Antony parish. 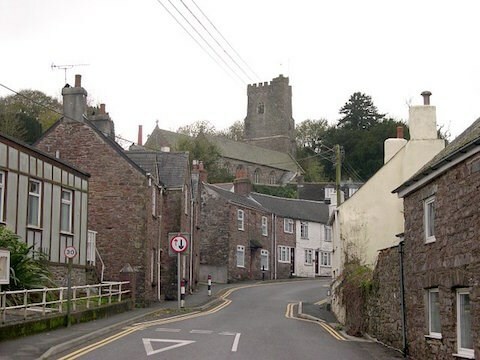 The parish is mainly farmland to the West, while the town of Torpoint lies in the east of the parish. There are two forts in the parish, Scraesdon and Tregantle; the latter is currently used as a base camp for the adjacent military firing range. Tregantle was built in 1865 to protect the port of Plymouth from French iron-clad ships, and was designed to hold 35 guns. The elegant church, with its spire, was dedicated to St James (the Great) on 14th October 1259. The present church is thought to have been built around 1420. It is situated on an eminence above the village, and the ascent to it is by flights of granite steps. The church was completely renovated in the middle of the 19th century. The old bench ends in the church have been incorporated into the pulpit and the stalls in the chancel. Climb up the long flight of steps from the roadside opposite the parking coordinates to the headline coordinates near the church porch entrance. Turn left at the church entrance and look on your left for a grave in memory of Caroline Lyttleton Loring. Because of proximity issues, the cache is a short drive away on a quiet lane where there is room to park whilst the cache is being retrieved. The final location is popular with dog walkers and horse riders so stealth may be needed.